Nothing is more fun, elegant, or cool than to have an under the stars party. This can literally mean a party at night either under the stars by a pool, under a tent, or creating the stars on the ceiling through light, on the walls, the dance floor and even the centerpieces. Under the stars is a great party theme that goes well when combined with a Dress to Impress Party Theme. Having guests arrive looking great goes perfectly with the under the stars theme. Having a party under the stars is a cool way to bring the outside inside and create a cool, trendy, elegant, upscale feel for a party. There are a ton of different party favors, supplies and decorations for a star party so you won’t have any trouble finding decor to match your theme. Remember that when planning this type of party that you’ll need lighting to make things stand out. All the decorations in the world won’t look that good unless you have some kind of lighting. Make sure to invite guests 30 minutes before you expect them to arrive, this will help your party start “on-time” budgeting time for the fashionably late. Picking out the right dress or suit that fits and looks great is important. Put a lot of thought into if you would like to be the center of attention or if you would rather blend in. Also think if you would like your gests to dress the same as you or if you would like to wear something different to stand out. This can look great for pictures if coordinated. If you tell your guests to wear black, you can wear black with a bright color or wear a colored dress to indicate that you are the star of your own star party. 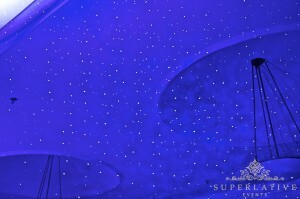 Having lighting that recreates stars on the ceiling can be a fantastic way to create a party under the stars. 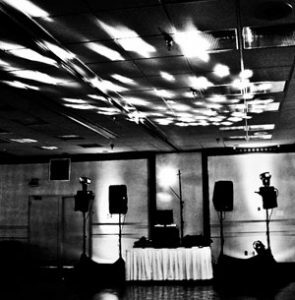 Two types of lights can be rented easily and used for your party. Star Projector Blisslight: A blisslight is a very cool light that creates a nebula/starfield pattern on the ceiling and covers a large part of the ceiling with a slowly moving pattern. Then it projects thousands of green pin-point stars on the ceiling. This light works in almost any situation and covers a very large area. 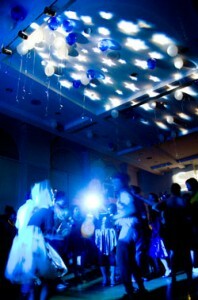 Blisslights are very expensive and it’s better to rent a star projector to get a starry pattern at your event. 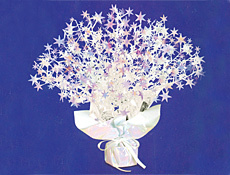 Star Gobo Lighting: Another light that can be used is gobo lighting. Gobo lighting is a light where changing out the template changes the projection pattern. These lights can be used on dance floors, ceilings, walls, or just about anywhere you want to project a pattern. Using a prism effect will help triple the coverage of one of these gobo lights. This type of effect creats a more defined star pattern on the ceiling. You can rent a star gobo projector and have it shipped to you. You can go with cocktail items, mini hotdogs, small finger foods, quiches, or go with the all around chicken tenders, eggrolls, and small items that are perfect for munching and mingling. Anything colorful is great. You can even use LED cups so you can light up the drinks perfect for creating sparkles in the ice of your guests drinks. Star items like hats, leis, boas can help your guests get into the ambiance of the evening more quickly. Give these items directly to your guests right as they arrive. This will help break the ice as they have something they can use for the evening. Give guests their star items as soon as they arrive. Under the star themed parties can be a lot of fun the only limit is your imagination! The more creative and off the wall ideas you can come up with, the more memorable the party will be for your guests. Remember that good food, music, and good friends are the keys to successful parties!